Welcome and transfer to Cusco and from airport to hotel. Welcome drink "coca tea" in the hotel. City Tour of Cusco Cathedral, Qoricancha, Sacsayhuaman, Tambomachay ... (afternoon from 13:00 hrs - 18: 30 hrs). Overnight at hotel in Aguas Calientes (Machu Picchu). Guided tour of Machu Picchu from 07:00 hrs. to 09:00 hrs. Optional: Hike Huaynapicchu or Sector Mountain (without Guide). Lunch in Aguas Calientes at the restaurant. In the afternoon return by train from Aguas Calientes to Ollantaytambo. Admissions to all the attractions to visit Machu Picchu and Huanapicchu, Sacred Valley, City tour and surrounding areas, churches and museums. 2 nights in hotel in Cusco. 1 night hotel in Aguas Calientes. 3 buffet breakfasts at hotels, a la carte lunch in Machupicchu, 1 lunch buffet in the Valley. Airline tickets, Lima-Cusco - Lima, if you want we can add the fee is approximately $ 240 (Rate Base) round trip per person, this fee may be increased according to schedule and space availability. First day: Reception and City tour in Cusco. On arrival at the airport in Cusco, we will be waiting with a sign with your name, then transport to your hotel where you will rest for an hour, take a cup of coca tea and evening come to pick them up at 13:00 hrs to begin the tour to the city of Cusco and surroundings, visit the center of the ancient city of Cusco, Plaza de Armas, the Cathedral, the Monastery of Santo Domingo, Koricancha Temple and the nearby ruins of Kenko, Puka Pucara, Tambomachay and the fortress of Sacsayhuaman, built with huge rocks that so far remains an enigma mobilization and use of these, there being no quarries in the area. At 18:30 hrs. (Photo: Plaza de Armas in Cusco). On this day tour to Sacred Valley tour that started at 8:00 in the morning, collected from the hotel to go to Pisac, which is a typical market, with picturesque terraced fields on the mountain. Visit the archaeological site of Pisac. It is also famous for its fairs where you can buy beautiful handicrafts.Then we head to Urubamba where we have included a buffet lunch. Then we go to the fortress of Ollantaytambo, where descendants of the Incas living in the home of the Incas.Finally we go to the Ollantaytambo train station to board the train that leaves at 16:36 hrs. hours to Aguas Calientes, arriving 18:00 hrs. averaging. Overnight at hotel in Aguas Calientes (Machu Picchu). (Photo: Sacred Valley of the Incas). Day Three: Tour to Machu Picchu "The Lost City of the Incas"
After getting up very early and have breakfast, climb the Inca citadel of Machu Picchu. After excursions with our guide to the citadel of Machu Picchu, visiting the Main Plaza, the Circular Tower, the Sacred Sun Dial, the Royal Quarters, the Temple of Three Windows and various cemeteries around for more two hours. Optional: you can do the trekking to the summit of Huaynapicchu or the Mountain sector, this will take a few hours, in which you can enjoy the scenery and take some breathtaking views (This visit is without a guide). Then descend by bus to Aguas Calientes in the afternoon take the train back to Ollantaytambo, where our staff will be waiting for you to transfer you by bus to Cusco. (Photo: Machu Picchu). Taking a good breakfast, the hotel pick you up from where they are staying and taken to the airport from the city of Cusco, which is minutes away from downtown Cusco, we must be one hour prior at least to make arrangements for flight confirmation, After checking with the airline to fly and pay the airport tax, we will say goodbye and take the flight from Cusco to Lima. Date of commencement of tour. Payment of 50% of the cost Deltour. Prices are in promotion to be paid cash, any payment with credit card will have a charge of 8% to the whole price of the choosen tour. Airline name (example: LAN, TACA, StarPeru, AEROCONDOR). Estimated arrival time (eg 10:25). First: You must enter the main page of Moneybookers Click on the button "register", choose the type of account is to be open in our case would be a personal account and complete the form with your details. No need to enter your confidential data (such as account number and card number), only use this information when making a transaction. Remember to fill it the details of your date of birth, as a security measure, you are asked when making a transaction or want to reset your password. Carefully select the currency to use as it is not possible to change this choice later. Remember that fields marked with an asterisk (*) are required. 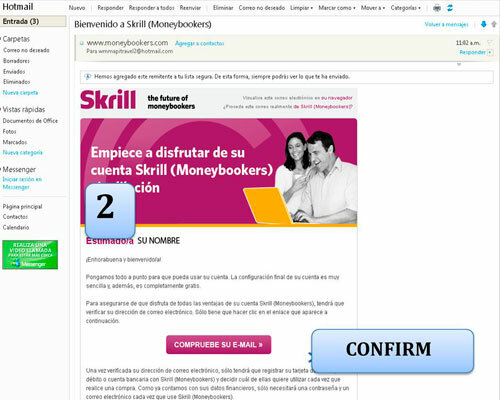 Second: We will send you an email to the email provided to Moneybookers, entering your inbox should confirm or activate the account created in order to do so click on the button "Check your e-mail". 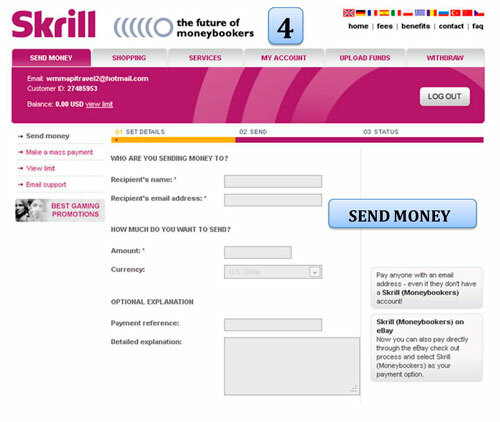 To send money you first have to load your Money bookers account for this most common way is by bank transfer to Money bookers for which it will provide the data necessary to complete the transaction. The recipient of your money transfer will be notified by email. 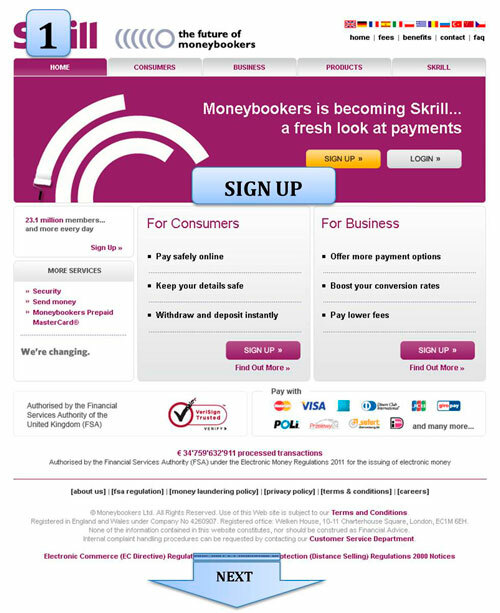 The beneficiary is registered in Skrill (Moneybookers) or log, if already registered. The beneficiary selected bank account, VISA or check as repayment option. The beneficiary withdraws his money. Benefits of Moneybookers to send money? It is not necessary to show the confidential information of your credit card when making purchases, shipping or any transactions online. 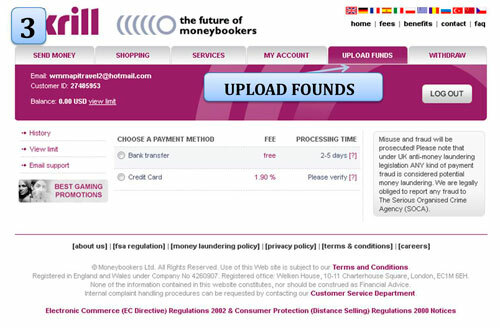 Moneybookers offers you to send and receive money in real time, without delays.